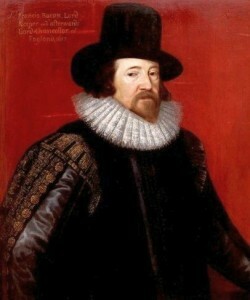 Bacon was born on January 22, 1561, in London, England. His father was a member of the royal court, and Bacon remained linked to the courtly elite for most of his life. From 1573 to 1575, he attended Trinity College at Cambridge University and later studied at Grays Inn, a London­ based law school. In 1584, he entered the English Parliament and began writing influential political tracts regarding the state of England’s internal and external affairs. His political status steadily rose throughout his career, and he held numerous coveted positions, including lord chancellor and privy councilor. In 1621, however, Bacon was convicted of bribery, impeached, and barred from public office. In the early 1590s, Bacon’s letters and speeches began to reveal his interest in philosophy. In his first lengthy work, The Advancement of Learning, published in 1605, he declared that human knowledge was deficient and that society needed to reform the way knowledge was taught and used. In the Novum Organum (published in 1620), which outlined his philosophy, Bacon criticized the school of Aristotelian logic, which had dominated philosophical thought in western Europe since ancient times. This traditional philosophy posited that knowledge and truth are revealed most effectively through deductive reasoning, which uses broad, general ideas to draw conclusions about specifics. Bacon introduced a new scientific method, based on inductive reasoning, which attempted to arrive at general truths through the analysis of specific facts. Retiring to a country estate after his impeachment, Bacon wrote a utopia, The New Atlantis, that suggested that science should not be an endeavor of isolated individuals (as it had largely been up to that time), but rather the collective pursuit of many scientists sharing their knowledge. Bacon died on April 9, 1626; several of his philosophical works were published posthumously. Bacon’s lasting contributions to science include his theories regarding scientific methodology and his ideas concerning the link between science and society. In the seventeenth century, science as it is thought of today did not exist in western Europe; there were no institutions of scientific research, little recognition that scientific endeavor can benefit society as a whole, and no standardized experimental methods. Bacon advocated filling this void, thus foreseeing the evolution of the modern scientific community. It is unclear whether Bacon was greatly influential in his own time, because it is difficult to detect the direct effects of ideas, as opposed to the direct effects of discoveries or inventions. Nevertheless, certain events indicate an indirect Baconian influence. The scientific communities Bacon detailed in The New Atlantis began to appear in Europe soon after his death, with the formation of societies committed to the advancement of natural philosophy. In 1662 the Royal Society of London for Improving Natural Knowledge was founded, and its members advocated Bacon’s philosophy of science. Bacon believed that humans could understand nature and control it, and he claimed that gaining knowledge of the natural world would give humans the power to improve their lives. These assertions suggest that the development of science is integrally connected to all of society, not just to those who practice science. Bacon’s ideas have persisted to the present and are reflected in the importance western culture places on science education, on the support of scientific research, and particularly on the development of technology. The methodology of most modern scientists reflects Bacon’s claim that scientific investigation should rely on the empirical evidence gained through observation and experimentation. Because of his insistence on the importance of inductive reasoning, Bacon is credited with having introduced a new scientific method distinct from the type of scientific investigation and thinking typical in his day. In reality, today scientists combine both deductive and inductive reasoning in their ideas and investigations.